It's a common complaint - a low battery voltage can cause the starter relay to fail resulting in the starter motor failing to shut off even after turning off the ignition. So, some people fix the problem by buying an aftermarket starter relay and replacing the OEM one. It's a cheaper option however BE CAREFUL TO SELECT A RELAY THAT HAS PROTECTION DIODE ACROSS THE RELAY COIL. Yes, all caps. If you fail to observe this caution, you risk very quickly taking out your Ignition Control UNIT (ICU) which is a very expensive mistake. There was a discussion about this topic on EEVBlog, but I'll include the two oscilloscope traces from that thread to illustrate the threat. When the engine catches, the ICU cuts the connection to the relay. The electricity does not stop flowing through the relay coil immediately and a very large voltage spike can result. The oscillation apparent on this scope trace shows the voltage spike when power is removed from an automotive starter relay. Take note of the annotation at the bottom. The minimum observed +ve voltage is 300V, the minimum observed -ve voltage is 388V, the peak-to-peak voltage is 688 Volts. This same voltage will appear across the transistor driver in the ICU, which will immediately kill the device. The trace below shows the same relay with a snubber diode installed as above. Now note that the oscillations are completely damped and the peak-to-peak observed voltage is 16.8 Volts. If you purchase an aftermarket starter relay, just make sure to add the required diode. It will cost you $0.50 more but you potentially save having to replace a $200.00+ ICU. Rob - you're showing a zener there too; what is it? I'll see if I can find a simpler schematic. There's no harm using the Zener and adding the Zener will assist the relay in releasing faster. The zener voltage should be low enough to avoid damaging the ICU's driver, but high enough to prevent the relay holding on too long -- probably 10-15V. So will that^ relay work with no issues? Apologies to revive a dead thread, but I may need one of these. YEs, that relay will work with no problems. @robmack wrote: YEs, that relay will work with no problems. using this relay do you still need to add the diode ? That is my question as well, does this relay have the built in diode, or do we need to add it? Euro Moto Electrics are a reputable Beemer spare parts supplier. Their offering will work as advertised. It is a Tyco/Bosch relay with the correct cross referenced part number. The less expensive version YamaGuzzi linked to is the same thing. @Two Wheels Better wrote: Euro Moto Electrics are a reputable Beemer spare parts supplier. Their offering will work as advertised. It is a Tyco/Bosch relay with the correct cross referenced part number. The less expensive version YamaGuzzi linked to is the same thing. OK... and I'm not trying to be funny, but that doesn't answer my question. I've seen no advertising. I don't know if they have the necessary diode in there. I'm totally going off the information in this thread, and apologies, but it's not clear if this relay has the diode everyone is talking about. So, again, is this relay all I need, or do I need to add the diode? I mean no disrespect. Just trying to be precise. It's no joke. Go up to post number 6 above, read it, and if you get a warm and fuzzy feeling you might have hit the jackpot. I have been using this relay for several years now, like a whole heap of folk, I suppose. @Two Wheels Better wrote: It's no joke. Go up to post number 6 above, read it, and if you get a warm and fuzzy feeling you might have hit the jackpot. Tyco V23232-A0001-X003 is a direct replacement for the stock/standard starter relay. Good thing. These are less than half what the stock replacement is going for, if you can even find one. If you note, the schematic depicted on the top of the relay case in that picture shows a capacitor across the coil terminals and a diode in series with one of them. 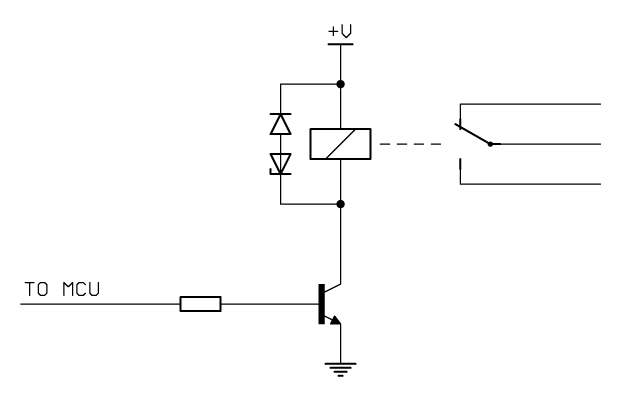 The capacitor can also act as a snubber in this application as much as a paralleled diode or resistor. I would assume that the manufacturer builds this device in accordance with this schematic. Since they depict a capacitor snubber, then I'd conclude it is safe to use on the Kbike. The specs printed on the relay also align with BMW's specs. You're good to go. @robmack wrote: If you note, the schematic depicted on the top of the relay case in that picture shows a capacitor across the coil terminals and a diode in series with one of them. The capacitor can also act as a snubber in this application as much as a paralleled diode or resistor. I would assume that the manufacturer builds this device in accordance with this schematic. Since they depict a capacitor snubber, then I'd conclude it is safe to use on the Kbike. The specs printed on the relay also align with BMW's specs. You're good to go. Thanks. I've just never, ever, ever, ever, EVER done any kind of electronics or wiring (besides some VERY basic household stuff). Ever. At all. I just ordered this relay from The Electrical Depot. Great service and communication. I was going to order from Wayteck Wire, but they were asking a bit more per unit and almost double the shipping cost of TED. Oh, and they also didn't have any. Claimed there was a huge backorder on them. Much appreciated guys, Robmack et al, I'm about to start the electrics for the K75k project and I was considering ordering a cheaper alternative to the very expensive OE starter relays. Good info, thanks.